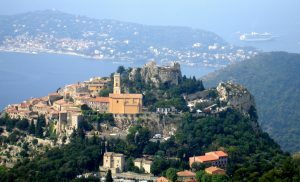 Villefranche-sur-Mer is an easy-going small town along the Riviera, a typical example of Mediterranean city. The narrow street will lead you towards the sea, passing by Italian-style buildings and squares, small cafés and the deep harbour. Situated between Nice and Monaco, Villefranche is easy to reach and its beautiful views, along with the amazing bay, will let you experience the Mediterranean atmosphere of the French Riviera. The harbour is one of the most important sights of Villefranche: it is quite small, but it brings you back in a fishermen village, with a beautiful view over the sailing yacht. 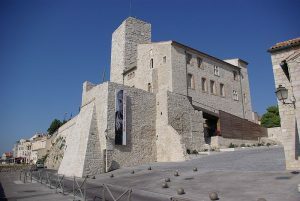 Then, you can walk along the footpath and reach the citadel, another main attraction: it was built in the XVI century and today it houses art galleries and the city hall. 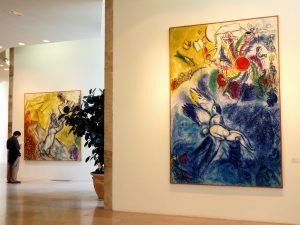 Villefranche’s cultural highlight is, without a doubt, the Chapel of St. Pierre: this beautiful building, decorated by avant-garde artist Jean Cocteau, has a unique style and interesting interiors. In Villefranche you can enjoy the landscapes booking a cruise trip (€18 for 2 hours); otherwise, you can enjoy the romantic seafront walk which will lead you from the harbour to the old town. Close to Villefranche, following the Middle Corniche which links Nice to Monaco, you can find the beautiful village of Èze: right above the sea, it has a unique style, composed of flowers, local gastronomy and elegant boutiques. 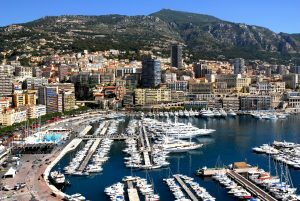 Within the French Riviera, it is definitely an unusual place: however, thanks to its particular atmosphere, you will certainly enjoy its sights. You can visit the Gardens of Èze, with 400 different plants, cactus and a breathtaking view over the sea. Then, you can move to the Fragonard Perfume Factory and see how perfumes are scented and made. On Sundays and Saturdays there are several markets in Villefranche. Try some local products or, if you prefer, you can go shopping around the city. You may also spend some time in one of the sandy beaches and have lunch around Place Pollonais, where tourists and inhabitants use to gather and relax. What are you waiting for? 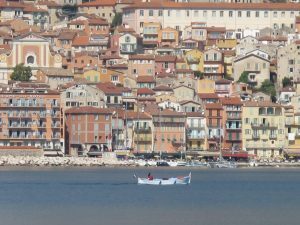 Go and visit Villefranche and Èze and their atypical Mediterranean atmosphere: you won’t regret it! The Hotel Negresco is a luxury hotel which, throughout the years, has become one of the most important historic monuments in Nice. With its pink dome and its elegant interiors, this amazing building will bring you back to the 18th century! The Hotel Negresco is a luxury hotel located on the Promenade des Anglais with a breathtaking view over the Mediterranean. 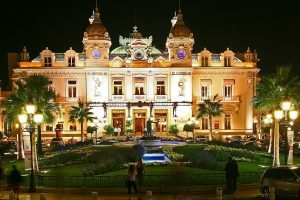 Henri Negresco, director of the Municipal Casino in Nice, built it in order to attract wealthy clients: there you can find a spectacular crystal chandelier, the famous pink dome and other amazing elements designed by the great architect Édouard-Jean Niermans. Today, the luxuriously decorated and furnished rooms (119 guest rooms and 22 suites) also house the two-star restaurant Le Chandelier. The Hotel Negresco is considered to be a national historic monument, thanks to his museum-like interiors based upon the 18th century. 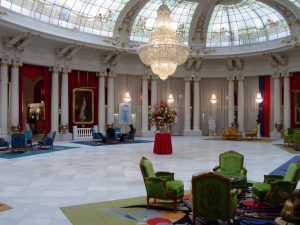 You can have a drink in the Salon Royal lounge room, where elegant exhibitions are usually held; otherwise, you can take a look at the Relais Bar and stroll around. Perhaps, who knows, you can also book a room or an unforgettable dinner at the Chandelier: they are both really expensive, but it will definitely be a once-in-a-lifetime experience! 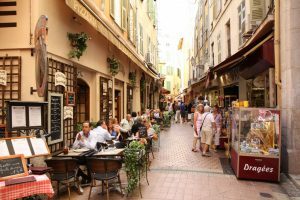 Vieux Nice – literally The Old Town – is the perfect place where you can discover old local habits, enjoy local markets and experience tradition. 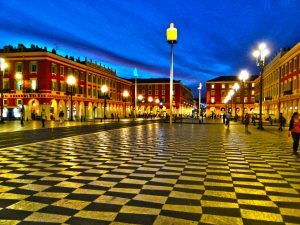 In Vieux Nice (the Old Town), you can enjoy many different delights: first, you can visit Cours Saleya, with its colours, its sights, its atmosphere (it was the main market of Nice in ancient times). Indeed, Nice is very famous for its flowers, then, don’t miss the chance to take a look at the largest flower market of the whole French Riviera, full of roses, carnations, flowers and plants of any kind. Within the market, you will also find different seasonal products, directly sold by the local farmers in their stalls. In Rue de la Poissonnerie, take a look at Adam and Eve and the Garden of Eden right above an old decorated door, then go down until the old baroque church of Notre-Dame-de-l’Annonciation. In the Old Town, you will have the opportunity to feel the Medieval atmosphere, enhanced by the narrow streets, old mansions and magnificent Italian-style balconies. Once in Place Rossetti, you might think you are in Rome: indeed, this famous Piazza links the French atmosphere to the Italian architecture. Don’t miss out the Old Town nightlife, with relaxing and elegant cafés, cool bars and a friendly atmosphere! In Antibes you will find the more relaxed and easy-going atmosphere in the whole French Riviera. With its narrow streets and its colours, the sandy beaches and the amazing harbour, you can find the characteristics of a small village which mix with cultural sights – such as the Picasso museum – and nature. The Old Port is certainly one of the main sights in Antibes: it is probably the biggest pleasure-boat harbour in Europe and it is linked to Fort Carré, a star-shaped fort which used to protect the town from enemies. Then, you can have a walk in the Old Town, where boaters use to gather, and enjoy the market hall, where you will find stalls with local products or restaurants. There are several museums you should not miss: first of all, the Picasso Museum, a three-floor building which offers one of the world’s largest collections of the artist (with paintings, sculptures and ceramics); secondly, you can visit the History and Archaeological Museum, where you will find Roman, Greek and Etruscan collections which show the old roots of the town. 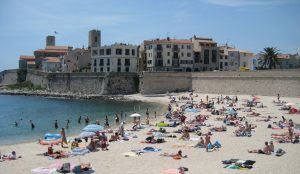 However, the best thing to enjoy in Antibes are probably its beaches: there are more than 20 beaches along the 25km-long coastline, though the best ones are between the port and Cap d’Antibes. Besides, you can also try some walks or hikes along the beaches and up the hill to get the best view over the city! Avoid Antibes on Mondays, when every important sight is closed. Antibes has many different dining options: you can eat at the Marché Provençal, packed with tourists looking for local gastronomy; you may try a romantic picnic on the beach or, if you prefer, a typical dinner in one of the restaurants or Tavernes. Cannes is the gem of the French Riviera: not far from Antibes, this city is worldwide known for the annual Film Festival, one of the most important in the world. However, Cannes has also many different interesting sights and a unique Mediterranean elegant atmosphere. 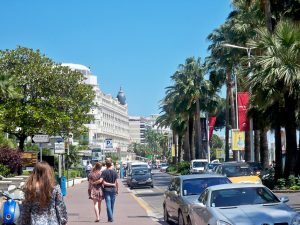 The Promenade de la Croisette is, without a doubt, the the most important sight in Cannes: it consists of a 2km-long road which extends along the shores of the Mediterranean. There, you can find the famous Palais des Festivals et des Congrès, where the Film Festival is held, along with chic boutiques, restaurants and expensive hotels. You can spend some time in one of the elegant cafés or, if you prefer, you can walk along the Promenade and take a break in one of the beautiful beaches. Then, you can visit Le Suquet – the Old Town – where you can find an exotic Russian orthodox church and amazing viewpoints over the city. There, you can also find the Museum de La Castre, situated within the Chapel of St. Anne, which houses collections from Pacific atolls and Pre-Columbian cultures. Half a mile off shore from Cannes, you can find the Île Sainte-Marguerite, with the famous fortress – called Fort Royal – where the Man In The Iron Mask was held around the 17th century. However, within the tiny island, you can also spend some relaxing time walking through the woods of umbrella pines and eucalyptus. Not far from Sainte-Marguerite, there is the Île Saint-Honorat, another tiny island which houses an old Cistercian monastery. Going back to the mainland, you can visit le Palais des Festival et des Congrès, which hosts the famous Film Festival and other relevant conventions and, if you are interested in modern art, you cannot miss the Art Center of La Malmaison, with masterpieces by Picasso, Matisse and Mirò. 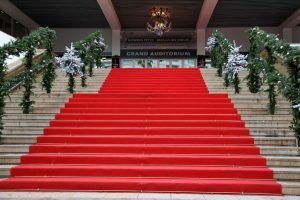 If you choose to go to Cannes during the Film Festival (around the end of May), remember that the town can be very crowded and there may be a shortage of hotel rooms! The city of Cannes also hosts the Midem (the most important tradeshow for music industry), as well as a great Carnival Parade. Within the city, you can also find chic restaurants and renowned boutiques, thus, you will never risk to get bored! The Prom – as those who live in Nice call it – was once a safe walkay for English aristocrats. Today, it has become a long and relaxing walk full of people who enjoy themselves and a beautiful view over the Mediterranean. 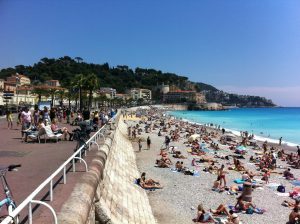 The Promenade des Anglais is a famous walk, or better, a famous Prom – as the local inhabitants call it –along the Mediterranean. In this 4-mile long promenade, you can join all the strollers, the bicyclists, the skaters and the families who usually or occasionally go there to relax and enjoy the amazing view over the Bay of Angels. Famous events, such as the Carnival, take place along the promenade. This belle époque-style walk extends from the Hotel Negresco to Castle Hill: along the way, you will pass by several beaches, Albert 1st Park and you will feel like the aristocrats who first created the promenade, in order to have a safe place to admire the beauties of the coast. 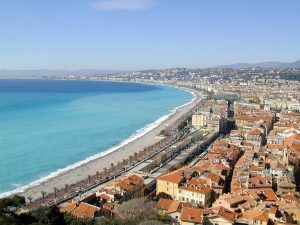 Without a doubt, the Promenade is the perfect place to experience the Mediterranean lifestyle of Nice: take a break and relax along the way or in one of beautiful beaches, you deserve it!